Braiding or styling your horse's mane and tail gives her a nice, neat appearance when done correctly. It is customary for show horses to have their manes done before they enter the show ring. Different styles are considered correct for different riding events and disciplines. It is important to select a hairstyle for your horse that will flatter him and please the judges. Even if you decide you do not want to braid your horse's mane, it is considered customary for horses competing in virtually all English and most arena-based western riding disciplines to have a pulled mane. Mane pulling involves shortening the length of the horse's mane to approximately 4 inches long by pulling out the longest hairs with a specialized mane-pulling comb. Mane pulling is preferred to cutting because it keeps the mane's edge natural looking in appearance. Traditional mane braiding is done for English riding events. The mane first is pulled and then braided into 35 to 40 half-inch wide braids. The braid contains a piece of thread or yarn, which is used to fold it in half and tie it in place against the crest of the neck. Braided manes are desirable because they give the mane a neat appearance while keeping it contained. Dressage braids may be rolled up further into a ball to form button braids or rosettes. Banding is similar to braiding and is done primarily for western events. 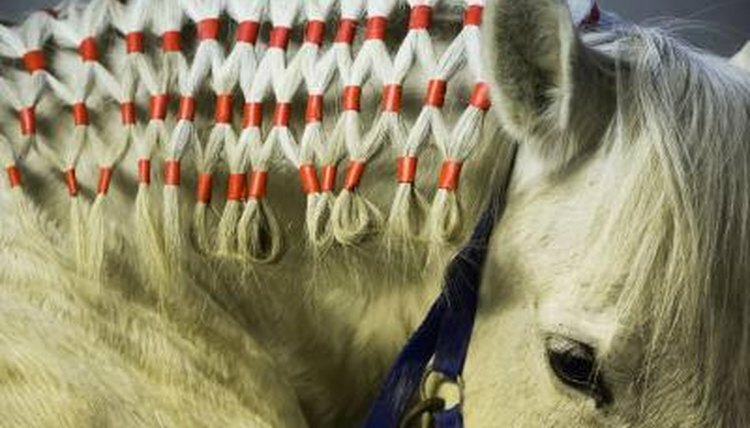 Banding involves dividing the mane into 35 to 40 half-inch sections and placing a small rubber band near the top of the section to hold the section together. Some competitors prefer to keep their horse's manes long. A couple of different options are available for a long mane in the show ring. The running braid looks like a long French braid and is created when the bottom portion of the mane is braided from the poll to the base of the neck in one long French braid. The diamond braid weaves sections of mane together to create a lattice or diamond-shaped weave out of the hair. The tail commonly is left loose and is not braided during horse shows, though some horse owners choose to French braid the top of the tail and leave the rest of it loose. Fake tails can be tied or braided into the tail to make the tail appear longer and thicker. Fake tails are very common in the show ring.